Casyopée is a free open-source software environment for the learning of functions at secondary school level. 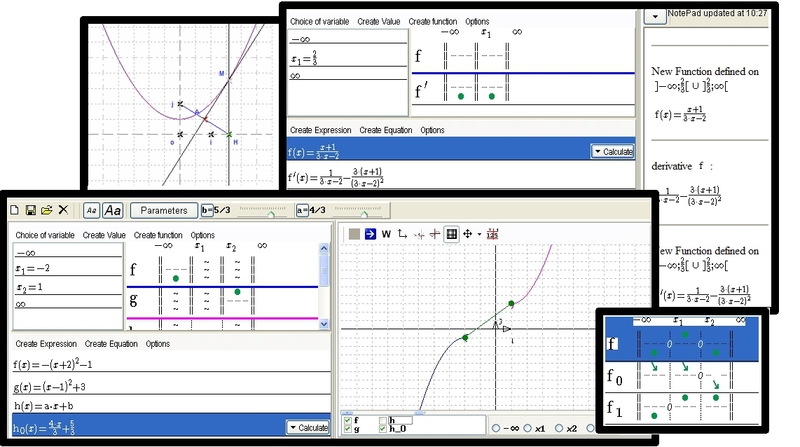 It aims at making numeric, graphic and formal exploration of mathematical functions easier. A dynamic geometry unit, integrated in CasyopÃ©e's environment, offers possibilities to explore and to model geometrical situations into functions. Casyopée is focused on problem solving about and using functions, modelling and proof. It gives specific help to the student in his/her activities, thanks to symbolic computation. the goal is to help the student, not to restrain him/her. With a piece of software like Casyopée, the role of the teacher is crucial: examples of classroom use are available through the "Using Casyopée" menu on the left. CasyopÃ©e works under Windows XP, Vista, Seven, 8, 10, with Linux and on Macintosh with a Windows emulator. It uses the open-source software Maxima for symbolic computation. The installation of Casyopée and of the relevant version of Maxima necessary is easy in a single operation. help for writing html based research reports including mathematic formulas created by CasyopÃ©e or with Latex, and graphs and geometric figures. modelling these geometric functions into algebraic functions in the algebra tab.